This outstanding book by Eric Morgan & John Stevens, published by Air-Britain (Historians) Ltd., is the definitive work on the Supermarine Scimitar, one of the Royal Navy's most memorable aircraft. 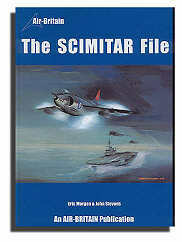 Their work covers every aspect of the Scimitar's life, from inception and development to sea-borne operations, and includes personal accounts by former pilots of this fine aircraft. The Scimitar single seat naval fighter was the last aircraft to be designed and built by the Supermarine division of Vickers-Armstrong Aircraft before it became part of the British Aircraft Corporation in 1960. Details are given the origins, ancestry and development of the type and of numerous planned developments which never materialised. Individual aircraft histories, Scimitar squadron and unit histories, personal reminiscences by former pilots and names of all known service pilots are included in this volume. Eric Morgan, who deals in depth with the development and production of the type, was formerly Librarian for British Aerospace at Weybridge and co-author of the respected "Vickers Aircraft since 1908" and "Supermarine Aircraft since 1914" published by Putnam. John Stevens was an aircraft handler who worked with Scimitars aboard HMS Ark Royal and later HMS Eagle and has dealt comprehensively with the service aspects.